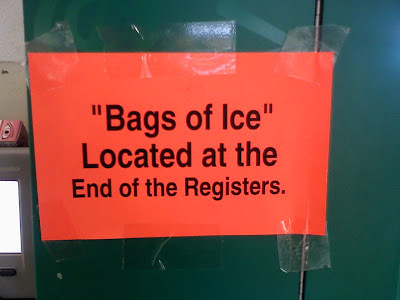 The “Blog” of “Unnecessary” Quotation Marks: "bags of ice"
I think "ice" is a euphemism for something. Diamonds? sacks of diamonds? Awesome. Thanks, Tom. This was at the "supermarket" in my "town". Well, if they're at the end of the registers, and it's July, and the store does not have air conditioning.....perhaps they are not always ice? They're a little too open about selling meth.